Happy New Year everyone. Given the ongoing discussions regarding sovereign debt, budgets and deficits, I just wanted to illustrate a few items regarding debt and a country’s ability to finance its debt. First off, one of the most common ways to discuss debt is in terms of the debt-GDP ratio. This is an important measure because to pay off the debt or to finance the debt, the government levies taxes on the underlying economy (taxes on production, employment, income, etc). In theory, the larger the underlying economy, the larger the dollar value of the debt may be, all other things being equal. 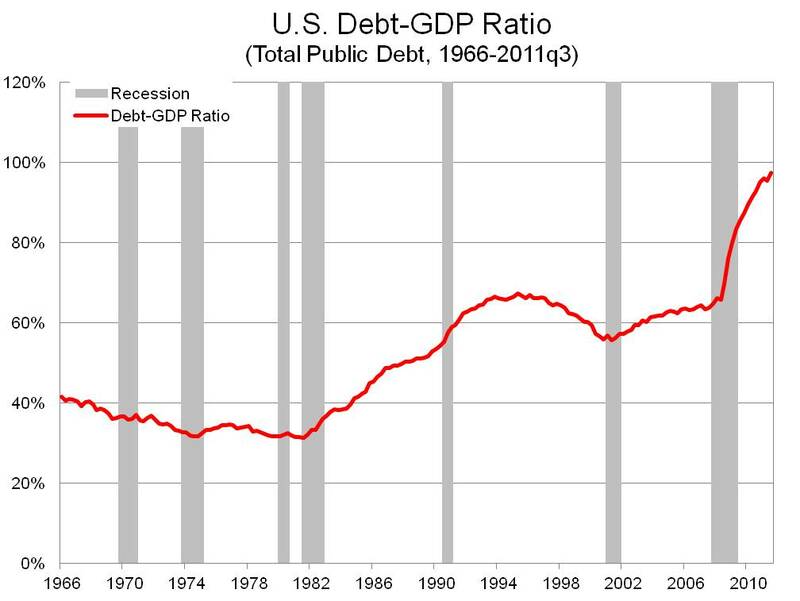 The graph below is the U.S. debt-GDP ratio on a quarterly basis since 1966. Note that this calculation uses Total Public Debt (both debt held by the public and intragovernmental holdings) and Nominal GDP. In order to bring down the ratio, two things may occur: reducing the debt outright by paying it off or growing GDP faster than the debt grows. Both of these actions have the same effect given that the ratio will decline. Under the first scenario, the numerator (debt) decreases while the denominator remains the same, while under the second scenario the denominator (GDP) increases faster than the numerator (debt) increases. After listening to many months (years) of discussions regarding sovereign debt levels, it feels like sometimes commentators forget this second scenario as most discussions surround reducing the annual deficit (annual figures) and the debt (accumulated over history), but typically leave out the economic growth variable. This is surprising given that this second scenario is how the U.S. (and other advanced economies) has typically dealt with reducing the debt burden in the recent past. This second graph shows the annual growth in debt and GDP since 1930. 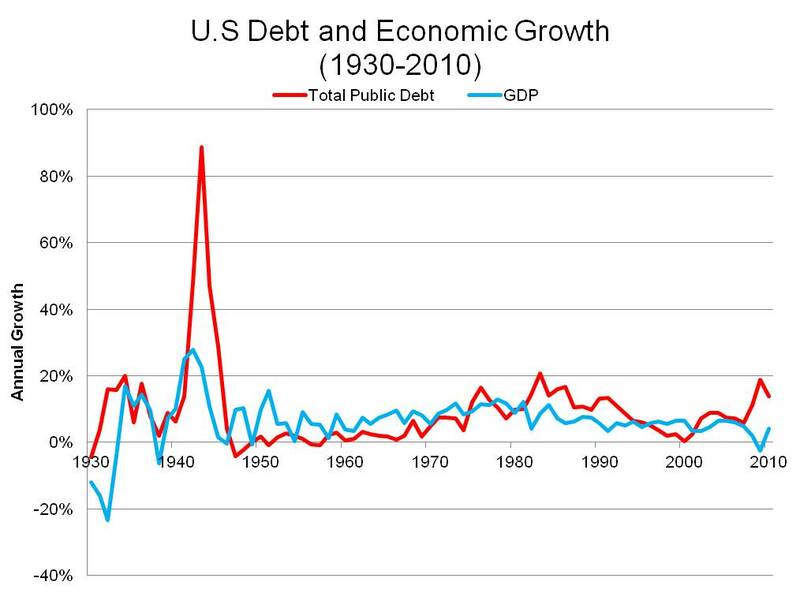 To reduce the debt-GDP ratio the blue line needs to be above the red line. Note that the red line is rarely below 0%. In fact on a fiscal year basis (using end of fiscal year figures), U.S. debt has not decreased since 1957 even though the debt-GDP ratio has declined at times. What this means is that while the U.S. ran huge deficits, leading to a large debt, during WWII, the U.S. actually never really paid down the national debt. (Debt did decline outright from $269.4 billion in 1946 to $252.3 billion in 1948, however this pales in comparison to the increase from $43.0 billion in 1940 to the 1946 level during the war) In order to finance the debt and reduce the debt-gdp ratio, the U.S. economy grew quickly during the 50s and 60s. For much of the 30 years following WWII U.S. GDP grew faster than the national debt, thus bringing down the debt-gdp ratio, however in the most recent 30 years, the opposite has largely been true. All of this is to say that strictly cutting or reducing the debt outstanding is not necessarily the most important issue to focus on when discussing sovereign debt, rather getting the economy growing quickly again (above potential GDP) which in turn will make financing of the debt easier. Certainly bringing down annual deficits is important and, at a minimum, stabilizing the debt-gdp ratio is desirable, however do not forget that there are two components to the ratio. One final thought. While the size of debt relative to the underlying economy is important, another major item that should be analyzed but typically is not discussed at all is the return on investment relative to the cost of borrowing. Or even more simplified: What are you spending the money on? State and Local Governments typically issue debt (bonds) for specific projects or policies in which their proposals lay out the needs for funds and detail how the money will be spent. At the national level such discussions rarely take place as the debt is more general and used to pay for the overall budget. Some of this has to due with the state’s balanced budget requirements and other fiscal limitations, which the federal government does not have. Each deficit is not created equal and the associated spending has variable rates of return depending upon what the funds are used for. At what percentage does this typically become a severe problem for a country? In other words, during recent history, at what percent of debt-to-GDP have other countries ended up defaulting on their debt due to soaring interest rates on their sovereign bonds?